St. Ursula Feast Day is Sunday, October 21st. 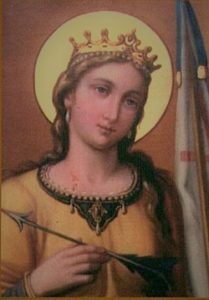 Ursuline Sisters across the globe celebrate the Feast of Saint Ursula on the 21st of October each year. Ursula was one of the early saints who inspired Saint Angela Merici as she was discerning the founding of her Company in 1535. Each king should put at her disposal ten girls. Each girl was to be accompanied by another thousand girls. The kings were to provide ships for a journey. Ursula was to be granted three years to dedicate herself to God. The young prince was to receive Christian instruction for baptism. Young people began arriving from all directions to join the voyage. During the journey, Ursula converted all the girls to Christianity and soon they arrived in Cologne, Germany. Here an angel appeared to Ursula and told her that she and all her companions would return to this place and win the crown of martyrdom. They moved on to Rome and Pope Cyriacus asked to join Ursula’s group. They set out to return to Cologne. Back in Britain, Etherius also decided that he would join them. All met up in Cologne where they encountered the aggressive Huns who were interested in women for pleasure only. Ursula and her young girls resisted this violation. Julius, leader of the Huns, instructed his army to kill them all, including Etherius and the ex-pope Cyriacus. Julius decided not to kill Ursula as he thought she was so beautiful he wanted to marry her. Ursula firmly refused his proposal because she wanted to keep the promise she had made to God to remain a virgin. Julius was so enraged he threw an arrow towards her, which pierced her heart and killed her. And so legend tells us, Ursula and her companions were martyred in Cologne.